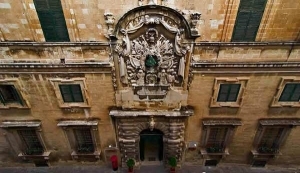 The Auberge d’Italie is one of the finest buildings in Valletta. This Auberge has a symmetrical façade, is rectangular in plan, and is surrounded by streets on three sides - Merchant’s Street, its main entrance, as well as Zachary Street, and Melita Street. It housed the Italian langue, composed of seven Grand Priories; Rome, Lombardy, Venice, Barletta, Capua, Pisa and Messina. The Auberge d’Italie, residence of the Italian Knights, was among the first to be built. The Italian langue was quite prominent mostly because of the geographical proximity between Malta and Italy, as well as because of the Presence of the Pope, who at the time, wielded considerable political and economical power. The current Auberge d’Italie was the second structure so-named to be built, since the first one was constructed in 1570 and was situated in Saint George Square, in Valletta. This was found to be too small in size and was integrated into another building a year later. The second, and current, Auberge was built in Strada San Giacomo, now Merchant’s Street, under the direction of architect Girolamo Cassar. Construction started in 1574 – the plan comprised a central courtyard around which rooms and halls were to be built. In 1576, the Italian langue began erecting its own chapel within the Auberge, as well. Originally the Auberge had only one storey, however the Knights decided to enlarge the building further in 1582, adding a second one. Cassar built the Auberge in his typical Mannerist style, however he varied the design of the corner rustications, as well as the mezzanine window frames, to reflect typical features of Italian renaissance architecture. In 1680, the whole façade on the side of Merchant’s Street was remodelled by Mederico Blondel, though features of Cassar’s rustications, as well as the cornice, were retained. The pilier or Chief of the Italian Knights was traditionally the Grand Admiral of the Order of the Knights of Saint John, commanding the fleet, the arsenals, the naval officers, the troops, the crews, and all maritime affairs. 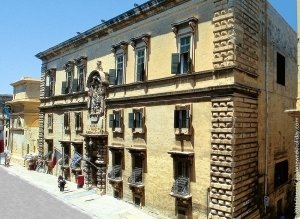 As with most buildings in Valletta, the Auberge d’Italie had various occupants after the departure of the Knights in 1798. When the French occupied the islands, it became the French Military Command. Under the British administration, it was utilised as a Corps Headquarters, as well as an Officers’ Mess until the 1920’s, when it started to house Malta’s Museum of Archaeology. During World War II, the Auberge was severely damaged, and after the war a significant part of the building had to be reconstructed. In 1956 the Auberge was being used by the Department of Museums as a School of Art, while in 1971, extensive works were carried out to accommodate the Posts and Telephones Department. Since then, it has also housed the Water and Electricity Department, the Agricultural Department, and the Central Office of Statistics. The Auberge d’Italie comprises the Offices of the Maltese Ministry for Tourism. 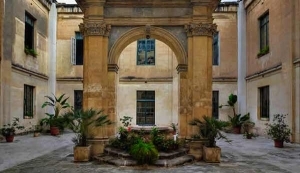 Parts of it are sporadically open to the public, as Maltese and international artists use its courtyard as well as a number of other spaces to mount exhibits and artworks.